There’s no better way to spend Father’s Day Weekend than in DTSF! Stop into Nyberg’s Ace Downtown, the Father’s Day Place with great gifts for dad! Give the gift of whisky and beer tasting, pulled pork, and BBQ during Bros and Brews at Atoley Salon & Spa. Drink beer together on the back patio at Remedy Brewing Company where the Doodles can mix and mingle during DOODS & BREWS. Take part in the Hops & Honda Tour at Woodgrain Brewing Co. for your chance to win a prize package, a 2-year Honda Civic Lease, and more! Chow down on a Big Sky Bison Burger and top it with some Montana Smoke Jumper Hot Sauce at Mackenzie River Pizza Grill & Pub! Take dad out for some live music at Icon Event Hall + Lounge! Violet and Kid Dakota start playing at 7pm. Start the morning off by shopping locally at the Falls Park Farmers Market. Grab some craft brews paired with live music by Dustin Priz: Live at Remedy Brewing Company. Bring the family down to Fawick Park for a free DTSF event: Moonlight Movies – Hotel Transylvania 2. Stop in the 605 Running Co. from a run or walk with dad on Father’s Day for milk from Stensland Family Farms and cookies from The Cookie Jar Eatery for Milk & Cookies with Dad! Enjoy a cultural experience at the Washington Pavilion and make sure to stop into the new SculptureWalk Visitors Center on the 2nd floor. 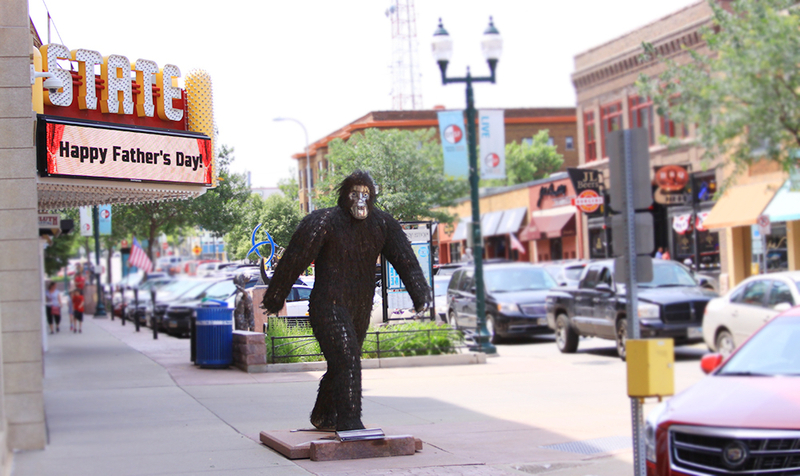 Take a selfie with the SculptureWalk Sasquatch! Know a rad Dad? Tag him in this post from the Great Outdoor Store for a chance to win this a Fjall Raven Travel Toiletry Bag and a pair of Exofficio underwear, and shop GOS for a gift! Whether it’s casual or tailored, J.H. & Sons has the classiest look for father’s day. The Beer Caddy is a great gift for dad to sample the latest lager, stout, pale ale, or local favorites. If your dad loves to spend quality time outside with friends and family, then he will love these nostalgic yard games. To view Simply Perfect’s full gift guide, click here. Did you know that June is Men’s Health Month? Shop for the perfect running shoe or exercise outfit for dad at 605 Running Co. Choose from Duluth Trading Company’s list of Coolest Dad Gifts.